Here's another sneak peek into what we are working hard on this week. Here's a little sneak peak into what we are working on for the Spring Market. Today we decided to do a little bit of spring cleaning in the classroom to see what materials we could use or throw out. In doing so we discovered a few items to use that we had forgotten about. We found cellophane colored paper that is great for using on the light table. Sienna and Sloane were really interested in using the paper in other ways. Sienna used hers to add on to the school bus, and Sloane used hers to try and put on her neck/shoulder/head. Today the kids were still interested in natural materials, so we added them to our soil sensory bin. Two of our children pointed to the play-doh and we put them on the table. They played for 25 minutes, which is an awesome amount of time to be interested in an activity. Time is flying! Can you believe it's May already?! We sponge painted our poster board, learned some new words in Spanish from Mexico, had some Guacamole and chips, and had some water play fun! We met our caterpillars, had some gym fun, and sat on lighting tables. This week we got to draw/decorate our yellow paper bags. These bags will be used for our potted plants that we worked on together. We have also noticed ever since we planted our seeds, the children have enjoyed playing with the soil in our sensory bin. Here they are helping water their plants. They loved helping out! We also used natural materials to see what would happen if we put them in water. What a fun week we had at Buckle My Shoe! We celebrated the "Week of the Young Child" with a different theme each day. We had Music Monday, Tasty Tuesday, Working (up) Wednesday, Thrillin' (Art) Thursday, and Flower Friday. Monday we gathered all the pots and pans and made LOUD BANGING music. Tuesday we made together a green smoothie (sent to us by Sally, thank you!). The ingredients inside was Pear, Avocado, Spinach, a pinch of ginger, and water. Wednesday we took recyclable bottles and boxes to turn into a mini city. 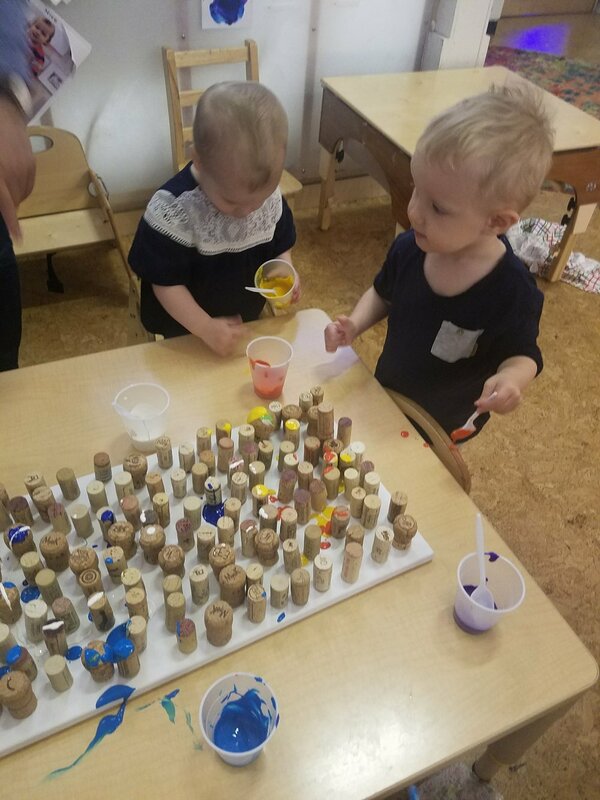 Although the boxes were fun to build up and knock down, the bottles were put on a styrofoam board with lots of glue and paint! 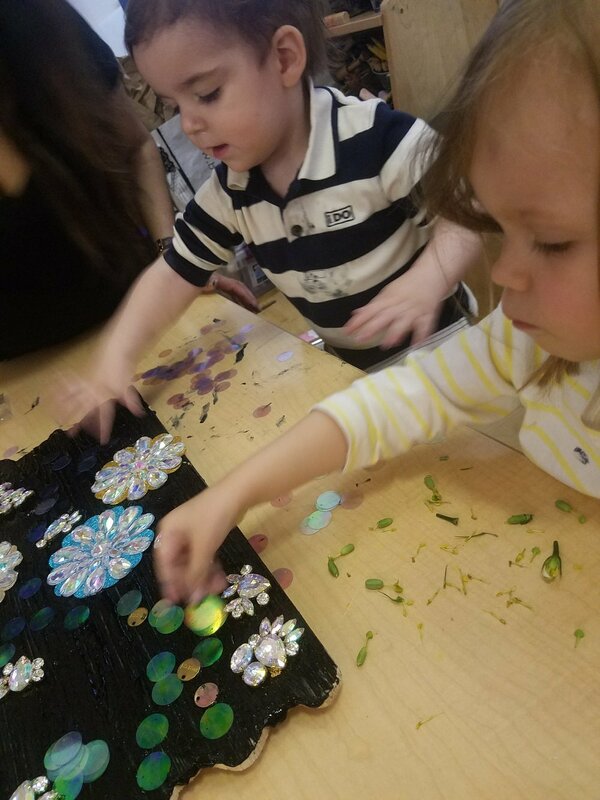 Thrashing Art Thursday was a hit! 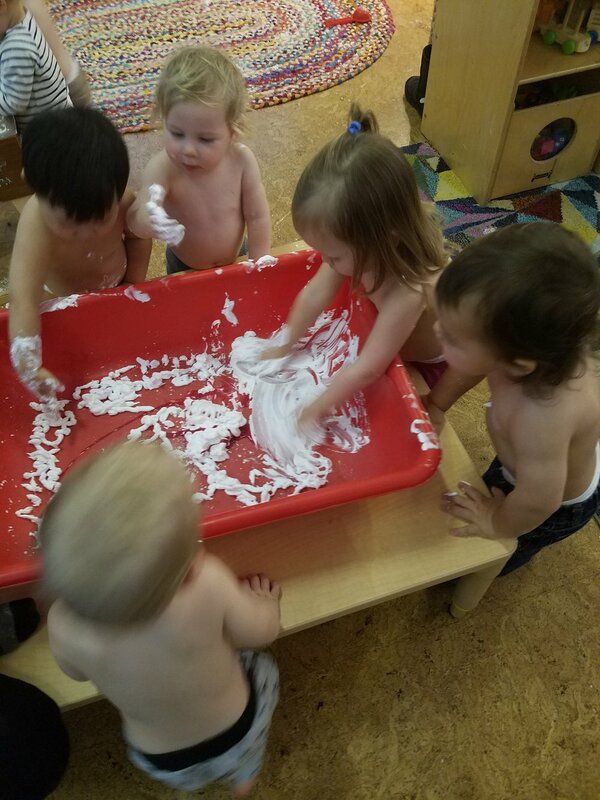 We took off their clothes, turned the tables sideways, and just let them decide how they wanted to paint. It was lots of fun! Flower(y) Friday was an awesome day! Thank you to all the parents that were able to come in and plant a seed. The children were really happy and all the food and drinks were delicious! This week the children have shown interest in letters. Although many may not exactly know or have a full understanding what letters are yet, we are now beginning to sing the ABC's song while pointing out the letters. We are also using their first letter initial to point out their names. Example, for Sienna we would say "S for Sienna! ", and point out what the S looks like. Once your child knows what their letter looks like, there may be a possibility they may point at other words (while outside or at home) that may have their initial in a different word. We loved watching how the children treated our tall giraffe in the gym. They were so thoughtful and caring. Giraffe got brushed, fed, hugged, and loved! 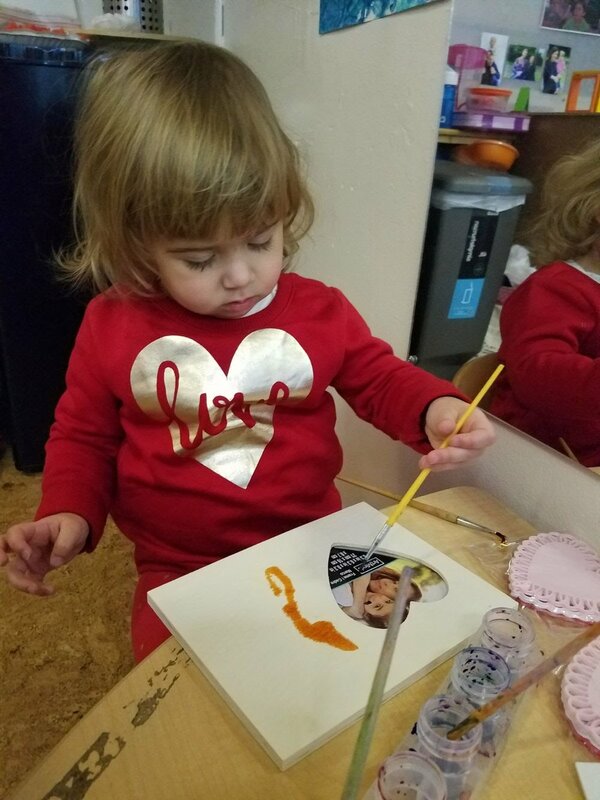 A great activity we worked on was painting the letters of the alphabet. We had them choose the color they were interested in. This week the children worked with clay. We put it in our sensory bin and let them come over naturally. Once we saw there was great interest we put on the green shirts/smock and let them explore with it. They poked, scratched, pulled, twisted, and rolled the clay. The interest of hiding or sitting in boxes is still present in the classroom. This time Sophie and Sloane had a different idea. They wanted to climb ON the box. Here they are showing how fearless they are. This week we noticed that Dylan loves sorting the pegs puzzle. He will take it out of the cup, and put it back in one by one. With pure concentration he repeated the same action five times. Impressive! We made pink play-dough too! This week the children were really interested in playing with all sorts of fabrics. They would use it to hide and play peekaboo, rub on their cheeks, or blow it from our fan (held by a teacher of course). We wanted to try something different this week and have morning meeting at the table. The children were not even phased by the change at all. They shook each other's hands and sang along to a couple of their favorite songs. A new behavior that we loved seeing this week was each child finding ways to imitate one another. We have found them sticking out their tongues at each other, blowing bubbles with their mouth, or stretching upside down together. We also celebrated Sienna's birthday!!!! Happy (2nd) Birthday Sienna! Thank you Tina for reading to the children. They really enjoyed it, and we loved seeing their reactions watching someone else who isn't their teacher read to them. It's been a short jam-packed month with class 1A. We were busy celebrating our love with our parents, our friends, and our community. Although this month was centered around Valentine's Day we used this opportunity to highlight "kind" moments. We have noticed that when we make a big deal out of a "kind" act the children have done, they want to repeat the same actions and continue to get praised for it. 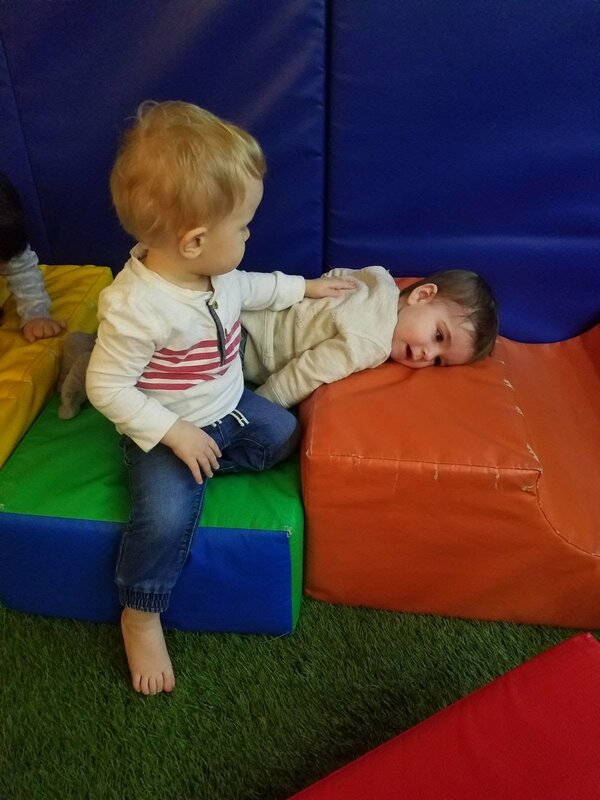 If a child falls, then another child will come over and help them stand up. When a friend is feeling sad, a different friend will come over and sit by them or pat them on their back/head. When their special friend enters the classroom in the morning and gets hugs and kisses. Our babies may still be babies however, the way they are showing so much empathy and caring for one another is amazing to watch. Here are a few of our highlights. This week the children worked on many sensory activities. The activity that really stood out this week that the children truly loved was adding shaving cream to our red bin and mixing it with red paint. In the classroom we have a child who is learning how to potty train. This has taken the class by storm! Sometimes a child will sit next to the potty-trainer and watch how it is done. Other times children will sit on the potty with toys or a doll (no worries, the potty is always fully sanitized after use). Because of the children's curiosity, we are naturally letting the children use it even if it's to sit on for a couple of minutes without any intent. It's a great pathway to becoming comfortable with the idea of using the potty once they show they're ready to use it. Peek-a-boo is still a huge interest in our classroom. 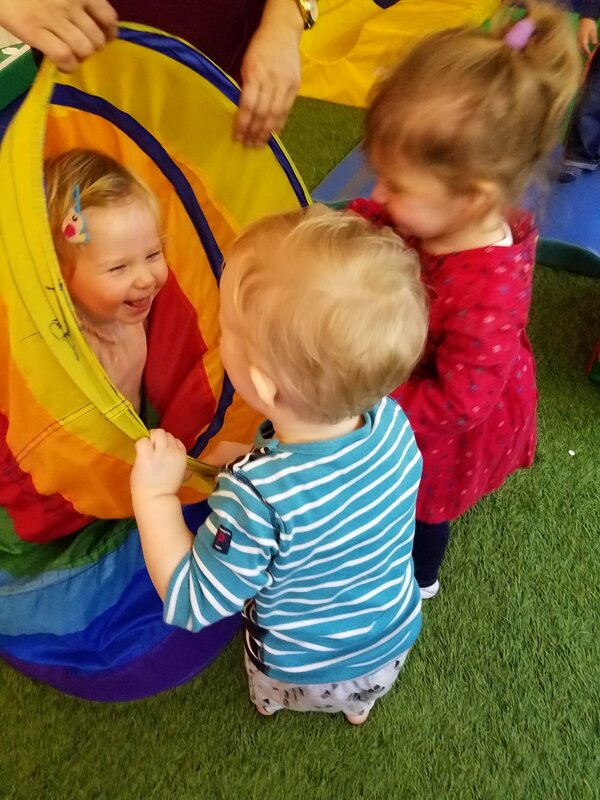 This week we used our colorful tunnel in the gym to hide each other. This week the children have been showing one another affection and love. Some come in with open arms ready to hug their friend(s), or they wave really fast and yell out loud "HELLO!!!" with pure excitement! We also worked on a variety of sensory activities to help children with their hand-to-eye coordination. Next week we will try our hand on baking something we can actually eat! Stay tuned! This week Evan our music teacher showed us 3 different flutes. A short-sized flute, a medium-sized flute, and a long-sized bald eagle flute. While we were in class on Wednesday, we noticed there was light snow falling down. We took the children two at a time to watch it come down. Have a wonderful weekend everyone! Don't forget to go on google drive for all the pictures. 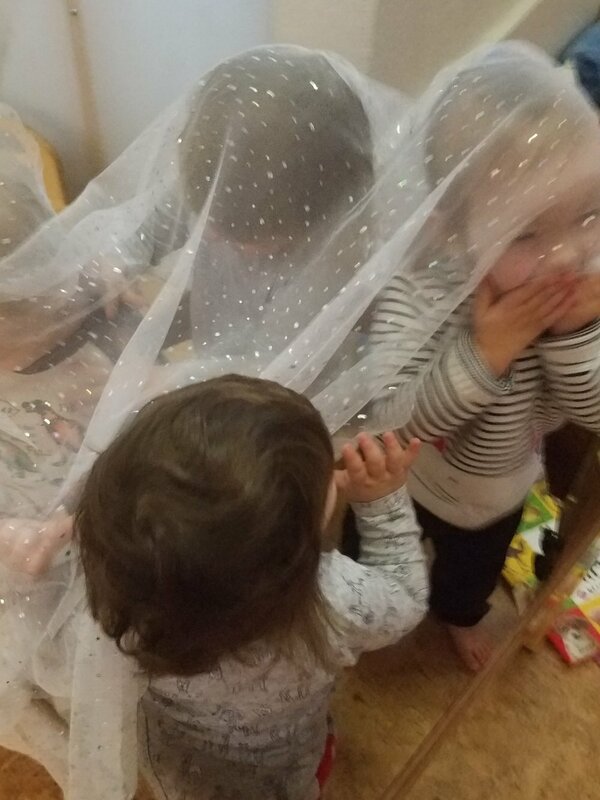 This week the children were interested in finding different ways to hide themselves or the objects that they were holding. Their favorite activity is to hide under blankets and scarves. Henry thought it would be great to hide behind a cd. Can you see him? Sienna used her legs to hide a wooden rectangle! They hid inside our colorful windows in the little gym too! The children also took an interest in speaking into long tubes. The vibration from their voices felt really good. Also, listening to someone say "hello" or making funny sounds on the other end had them giggling with delight. Welcome back to the first week of January! We could tell the children were ready to get back to being with their teachers and friends. On Tuesday we let the children have a true open play day. They were so happy to have all their toys and books back that we just let them explore the room and have them choose what they wanted to play with. We also had Spanish. It was Sienna's first time attending Spanish class and she really loved it. The Spanish instructor even stated "I think she's ready to take my job!" We also had the pleasure this week of meeting two new students to our classroom. Nico and Grey! Nico loved our yellow school bus while Grey loved listening to music and shaking along. Today we played with snow inside the classroom. 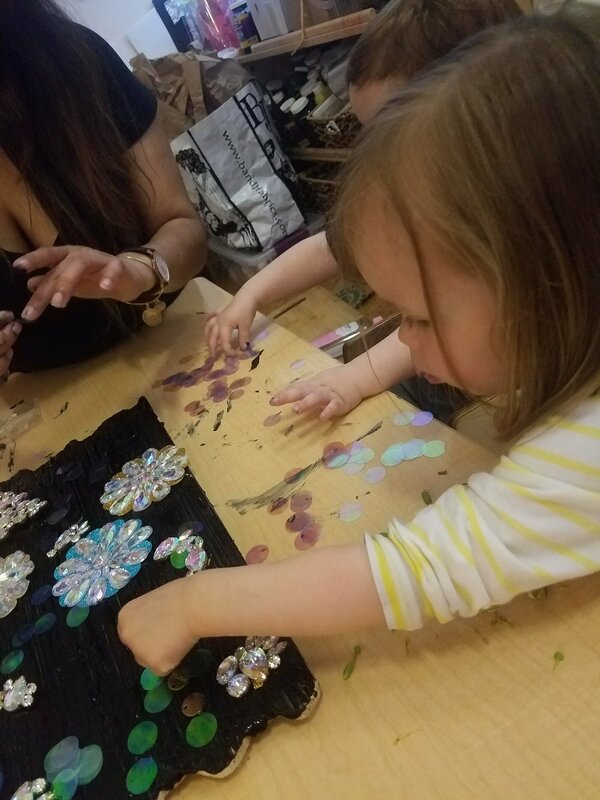 We placed it on a tray, provided a few tools for those that did not want to touch it, and observed how they carefully placed it on their fingers and swirled it around.